Laura offers a FREE first / introductory lesson! 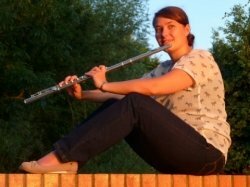 I am a UK and Germany based musician with a Masters degree in musical performance and a Bachelor degree in Music Education (specialised in flute). I am currently the General Manager of Arts@Trinity Leeds and the founder and Musical Director of the Arts@Trinity Flute Choir. Apart from leading and playing in the Arts@Trinity Flute Choir, she is also a member of rarescale Flute Academy, Ensemble Chameleon, Departure Lounge Experimental Arts and the Leeds Philharmonic Chorus. Laura completed her Bachelor of Arts in Music Education Classical Flute degree in 2013 at the University of Applied Sciences Osnabrueck. During her time in Osnabrueck she played chamber music in various combinations including 2-8 flutes; flute and guitar; flute, viola and guitar; wind quintet and also symphonic orchestras. Her teachers included Gudrun Ravens-Speckert, Nicole Goedereis-Buller and Gary Woolf. After finishing her degree Laura decided to go on studying in her other home country of England and do a master’s course in performance. She enjoyed lessons with Karin deFleyt, Carla Rees and Martyn Shaw. Laura also took part in summer schools and master classes with Clare Southworth, Ian Clarke, Carla Rees, Heike Malz and Gary Woolf. I have been teaching flute one-on-one and in groups as well as directing big ensembles in various age ranges. I love passing on my passion for music to others, helping them to enjoy the fun of making music as much as I do. In the past I have also given workshops on contemporary playing techniques on flute and workshops on chamber music. For me music is mostly about fun and making music with friends. I want my students to have a positive experience at all times. I strive to get the best out of my students and those of my students who have taken exams in the past have all passed with good results.